The St Mary's Swimming Team headed off to Wright Robinson College on Monday to compete in the Manchester PE Association Swimming Gala. They children were excited to be competing, after weeks of training. They worked hard and competed well as a team. The St Marys Swimming Team headed down to Manchester Aquatics Centre on Monday to compete in the City Wide Finals. The children were very nervous at first, until they had completed their first, individual event. They showed great resilience and determination and they never gave up. The girls team competed in the Main Competition, against the Top 5 schools in Manchester, finishing 5th overall. The boys team competed in the Plate competition, finishing 5th in their competition and 11th overall. Well done to all swimmers - you should be very proud! St Mary's swimming team headed down to Wright Robinson this afternoon to compete in the South & East Manchester Swimming Gala. The children were very excited and nervous, but this didn't stop them! They showed great determination and resilience and co-operated well as a team, cheering each other on. They each competed in 3 races, 1 individual event and 2 team relay races. They did extremely well, doing themselves and St Mary's proud. Well done everyone! Both the girls and boys team have qualified for the City Wide Finals at Manchester Aquatics Centre on Monday 5th March (10am - 12pm). A very well done to all swimmers and good luck in the finals! St Mary's boys swimming team went to the Aquatics Centre to compete in the City Wide Finals on Monday 6th March. The team competed in the B Plate Final and finished 3rd place overall. The boys cooperated well as a team and showed great determination in their races. Their bronze medals were well deserved! Well done to the boys swimming team! Freestyle Individual Races - 5th & 4th place. Medley Relay - 3rd place. Freestyle Relay - 4th place. OVERALL TEAM FINISHING POSITION:- 3rd Place. St Mary's competed in the Central & East Swimming Gala at Wright Robinson College on Monday 6th February. The team consisted of 4 boys and 4 girls, with each child competing in an individual event plus 2 team relay races. Freestyle Individual Races - 4th place. Medley Relay - 2nd place. Freestyle Relay - 6th place. Freestyle Relay - 3rd place. The children swam extremely well. They showed great resilience and challenged themselves in every race doing themselves and St Mary's proud. Great fun was had by all, well done St Mary's swimming team 2017! The boys team have qualified for the City Wide Finals at the Manchester Aquatics Centre on Monday 6th March 10 - 12pm. Well done to the boys team and good luck in the finals! St Mary’s Year 5 swimming team competed in the Central and East Primary Swimming Championships at Wright Robinson College on Monday 1st February. The children were very excited about the swimming competition, after being selected to represent St Mary’s, following a time trial the previous week. The team consisted of 4 boys (Kian, Leo, Charlie and Jacob) and 4 girls (Aimee, Elizabeth, Afia and Zoe). Each swimmer competed in a single 25m race, swimming either backstroke, breast stroke or freestyle and in a freestyle team relay at the end. Combined Result (Boys & Girls):- 2nd Place. 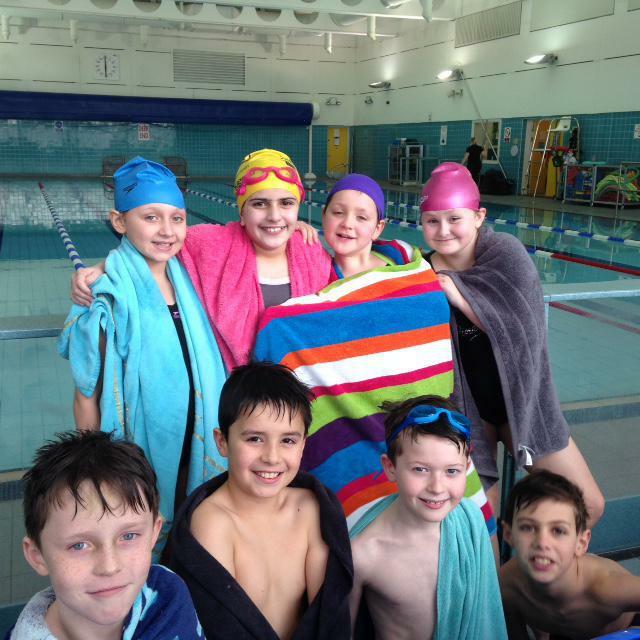 The team qualified for the City Wide Finals on Monday 29th February at Manchester Aquatics Centre. The children swam very well, against hard competition. St Mary's finished 5th overall in the City Wide Finals. Well done St Mary's swimming team!